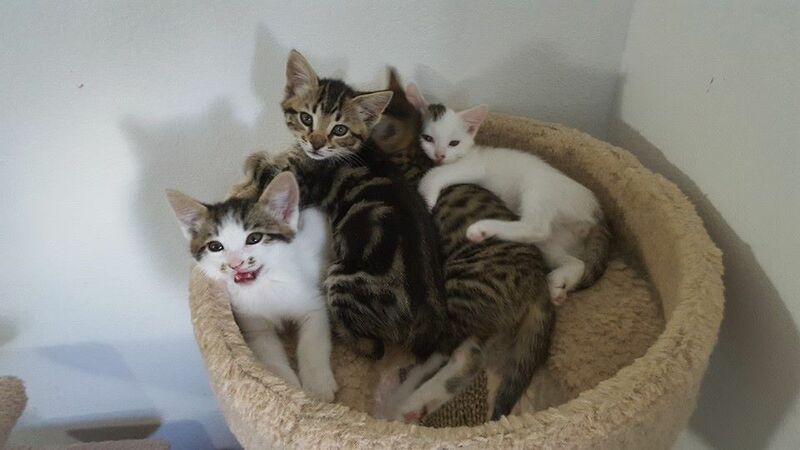 UPDATE 11-14-15: All the B5 Fosters have been adopted into their “fur-ever” homes. Lyta is in a new home with new cat friends, Marcus and Susan were adopted together, and a family who has two of the Mythbuster kittens took Delenn, Lennier, and Elizabeth! Here’s to happy furry-tail endings for all of them! You often don’t know what it will be that turns you into a fan of something. That turn of phrase from a certain writer. That specific delivery from a particular actor. A random thing a friend said or a reviewer wrote that made it click for you. My fascination with the culture of kitten-cams is a bit different. I was on Twitter, where I follow Grant Imahara, the former “Mythbusters” robot expert, and in the fall of 2012 he joked about being startled by a sudden rustling from his computer. It took him a few moments to realize that among his many open tabs in his web browser, he’d left up the one with a kitten cam on it. At the time, I was amused and moved along. Then in the spring of 2013, Twitter yet again directed me back to this kitten cam, because now there was a litter named after the Mythbusters themselves. And this time I went looking and found a round-the-clock live feed of a rescued mama cat and her four kittens, being cared for by a volunteer for an animal shelter. And that’s how I discovered and became a fan of Foster Dad John and kitten-cams. John Bartlett has been fostering cats and kittens for a shelter near Seattle, Washington, since 2008. Foster parents for shelters keep the animals in their homes, feed and socialize them, arrange for vet care, and bring them to adoption fairs. The shelters, non-profits that depend on volunteer help, specialize in rescuing, spaying/neutering, and finding “fur-ever” homes for dogs and cats who would otherwise be euthanized in a county shelter. Bartlett set up a spare bedroom in his house exclusively to house his fosters. He eventually set up a webcam so he could keep an eye on things and decided to share it. As his audience grew, he took to naming mama cats and kittens to reference some of his favorite SF and pop culture. There were the Ripley fosters named after “Alien” characters. There were the Cosmonaut kittens and the Looney Tunes fosters. Hitchhikers and Simpsons and Ghostbusters. Recently a litter of nearly identical Siamese kittens were the Clone Troopers. And now his latest set is named in honor of “Babylon 5” and FDJ is happily singing the praises of the show during Periscope recordings of the kittens at play and pointing people to sources for watching it on his Facebook page. Already kitten-cam viewers who know the show are persuading other viewers to give it a shot. Lennier’s original name was Sheridan, but Foster Dad John quickly decided that wouldn’t fit because this kitten was shyer than the others and often sat apart, contemplating the action before him. The kittens will stay with Foster Dad John for at least two more weeks – the shelter, Purrfect Pals, neuters and spays kittens when they are both eight weeks old and over two pounds. Go and check them out while you can! Thanks for making my productivity at work drop to zero! Oh my, that’s my squee button right there…. I apologize for your lost productivity…but I’m right there with you.